So far in Turkey we’ve managed to stay in a range of pretty lovely hotels and apartments. Maybe it’s just because we’re still slightly awed by the regular appearance of toilet paper in the bathrooms post-Africa, but everything’s been pretty good up til now. Selcuk, however seems to have conspired against us in the fact that, for each of the 3 nights we’ve spent here there’s been some kind of extremely loud event happening right outside our hotel window. Night one was people busking with something that sounded awfully like bagpipes, night two was a concert with huge speakers pointed directly at our windows (and less than 100 metres away) and today there’s been a great deal of industrial noise which has now abated, no doubt to lull us into a false sense of security for this evening. All that aside, our bathroom door requires pliers to open from the inside and breakfast consists of slices of cucumber, tomato and a hard boiled egg. I like eggs, but not every morning for two weeks. 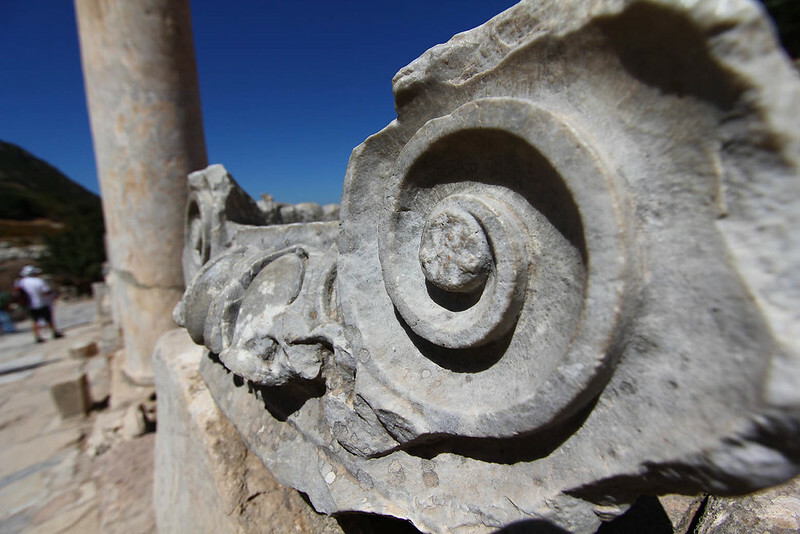 But the reason we’re here is not the dubious charms of Wallabies Hotel but Ephesus, one of the largest and most-intact Roman-period archeological sites in the world. Romans built things for keeps. Lucas visited yesterday, Luke and I went today as yesterday we spent all day planning our next leg in Italy. 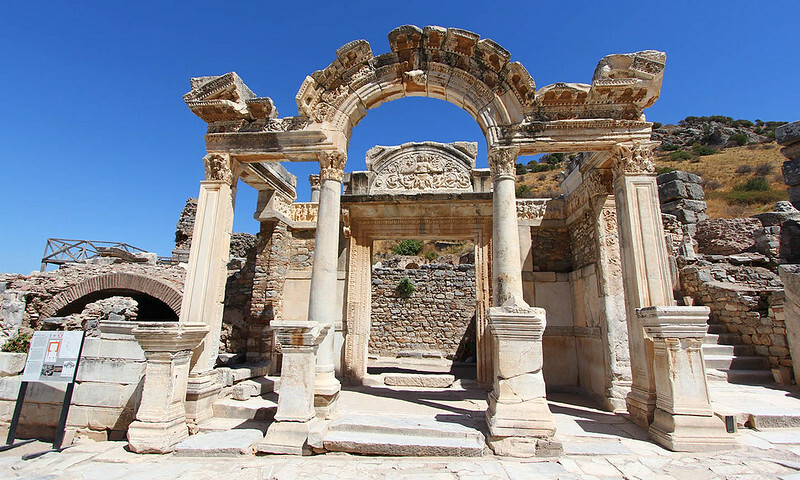 Ephesus is a short bus ride from Selcuk – in fact if it wasn’t for the heat it’d be more than walkable. Maybe 4kms? We took the bus because we’re lazy. We also took drinks from town – apparently a bottle of water on site can be as much as $5 (AUD) but a litre of peach iced tea was about 50 cents (AUD) in the local shop. BARGAIN. I’m probably going to cry when I get home and can’t live on it like I do here. 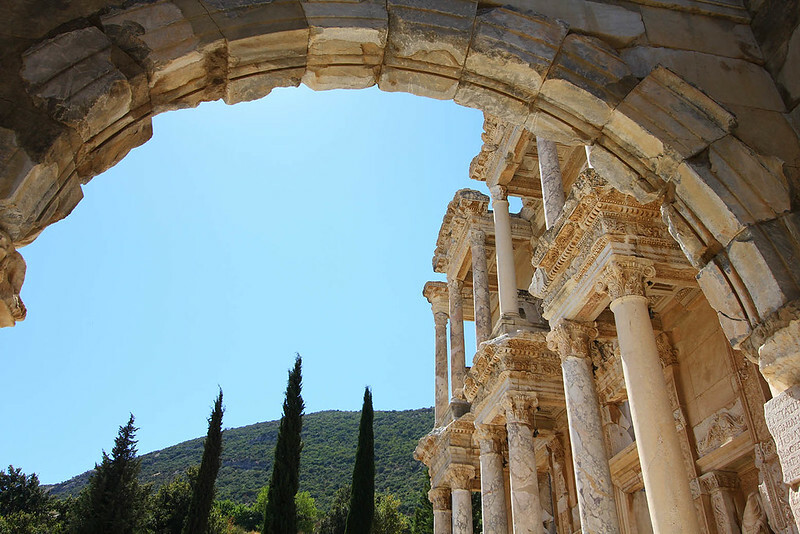 But Ephesus! 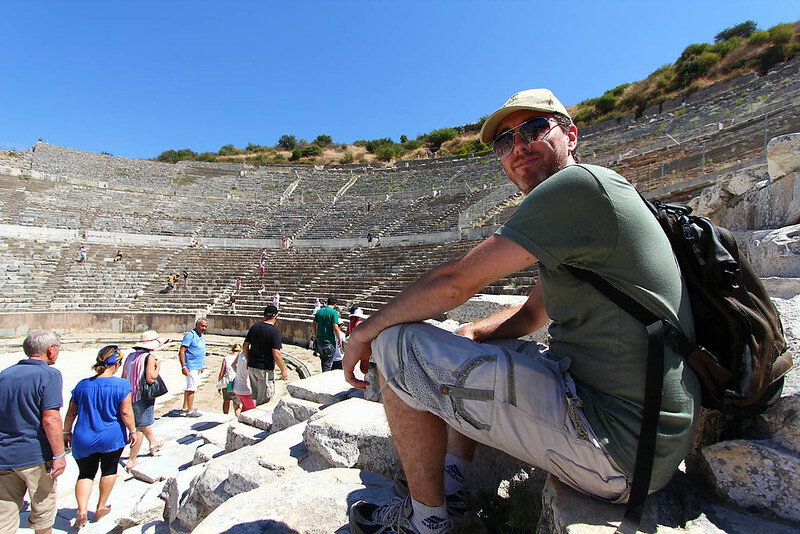 Lucas had warned us that the best plan was to walk through the ruins to the top of the hill then wait for a break in the tour bus groups and walk between them, thereby seeing the ruins without crowds of people in every shot. I’m pretty sure this says something about buying carpets. Boy was he right. At some points on the way up I had to almost shoulder people aside just to get past and the walkway was several metres wide. Also, for the prospective visitor – wear shoes with grip. That goes for all of Turkey, in fact. They have this thing about paving everything in super slippery marble. I’ve nearly fallen several times and watched at least three people nearly fall while we were there. Still, once we’d found our space and realised that the groups don’t go off the main track, it was possible to look at the view, touch the inscriptions and get some nice shots. Look at the colour of that sky! Perfect day to be out taking photos. No Photoshop required;). 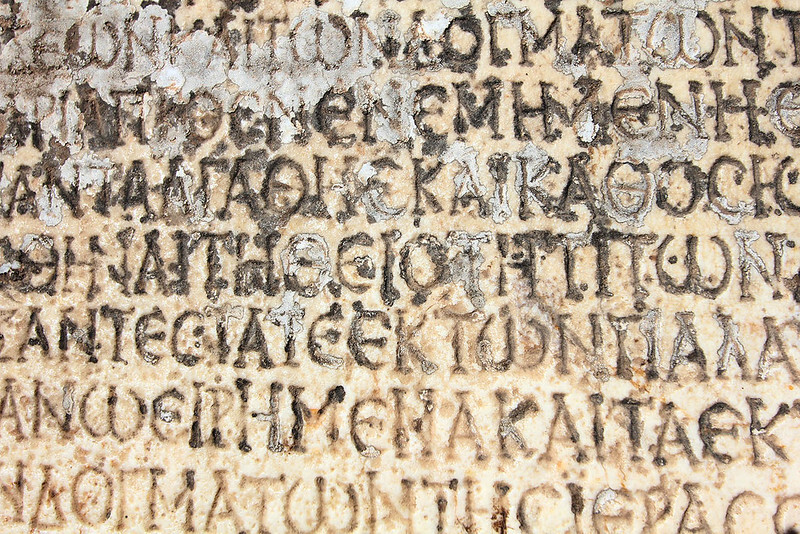 I used to love Ancient History. Mostly because I loved my teacher (in a platonic way (see what I did there?) hrm… are brackets within brackets ok?) and he made it really interesting. He’d tell us stories of Greece and Persia and Rome as though it was some kind of soap opera, which in many ways it was. The whole subject is also full of pointless yet interesting details that my brain latches onto like a mouse onto cheese. And yet coming to places like this, while I appreciate the antiquity, history and probably know somewhat more about it than half the people there that day, it just didn’t really do it for me. Maybe it was the heat, maybe it was the number of historical sites I’ve seen this year but I couldn’t help wishing I had my friend Oli by my side, someone who was much more knowledgable and passionate about the subject than I could currently be and who would fill me with his enthusiasm. 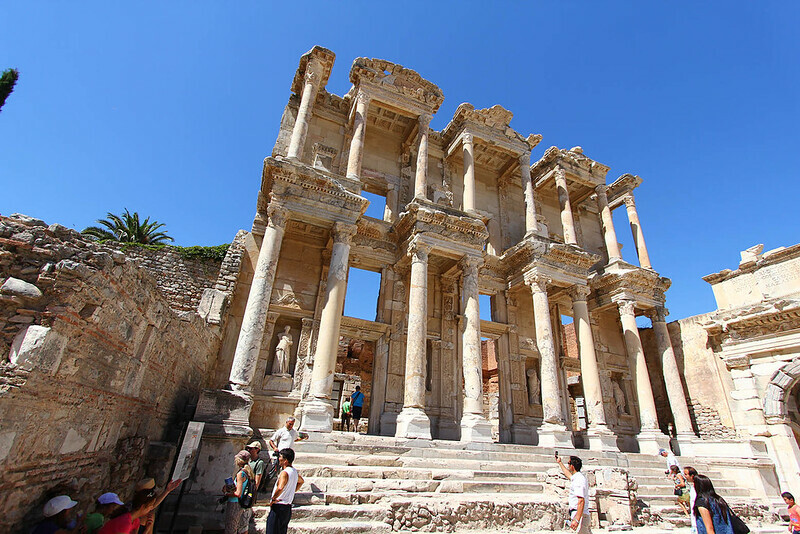 This building was destroyed by an earthquake nearly 2000 years ago and is in the process of being rebuilt. This is our last night in Turkey and it’s been great. We’ve had fun traveling with friends but tomorrow we’re saying goodbye to Lucas (for now) and heading to Rome via Istanbul. Lucas doesn’t know where he’s going but will work it out at the bus station tomorrow. Since Luke and I have done the touristy thing in Rome already, this time it’s going to be about the food. I’ve already got a few places picked out. Roast pork, red wine and gelato here we come! That must be why I enjoy your blogs so much , my mind seems to work the same way, endless random details that ( to me are fascinating) , it seems that if I am interested I find it hard to forget. Safe onwards travel, enjoy every moment! Ciao! You know, I thought about the square brackets but then thought it might look weird. Apparently not! Italy is where we’re at now, could’ve spent another month in Turkey though if we’d had time! If and when we return I’d definitely leave it for a slightly cooler time of year. It’s a lovely country you’ve got there:). It’s a funny thing. I loved history in school and still really enjoy reading and learning about lost cultures but I’ve discovered I’m not a fan of ruins-based tourism. These sorts of sites just wind up feeling sterile and artificial to me, cut off from the day-to-day living and culture that would give them proper context. I get more excited about sites where people still live and interact with history, or ruins that are being subsumed by nature and are still part of the natural world than I do about these archaeological parks. I find the experience a little sterile, I guess. I like my culture messy and lived in, rather than neatly distilled down to plaques and dioramas. Yeah, and there’s nothing that ruins a ruin more than a million people trying to sell you stuff and crowds. Makes it all feel like Disneyland with the rides or decent toilets:P.
Yeah, gotta say the crowds really soured Macchu Pichu (aka Inca World) for me.